1. The following are some family rules. Complete them, using the phrases below. Add a few more if you can. 2. Read the list in 1 again. Choose the three most important rules that your parents often apply to you. Think of the reason, and write them in the space provided. 3. An English teenager is going to stay with your family for two months on a cultural homestay programme. Complete a letter to inform him / her of the rules in your family. Write between 160-180 words, using the suggested ideas in the list above. 1. My parents don't let me stay out late at the weekend. 2. They make me keep my room tidy. 3. They tell me to take my studies seriously. 4. They warn me not to smoke or take drugs. 5. They want me to have good table manners. 6. I am not allowed to stay overnight at my friend’s house. 7. They forbid me to swear or spit on the floor. 1. Cha mẹ tôi không để tôi ở lại muộn vào cuối tuần. 2. Họ khiến tôi giữ phòng của tôi gọn gàng. 3. Họ bảo tôi học nghiêm túc. 4. Họ cảnh báo tôi không hút thuốc hoặc dùng thuốc. 5. Họ muốn tôi có cách cư xử tốt. 6. Tôi không được phép nghỉ qua đêm tại nhà bạn của bạn tôi. 7. Họ cấm tôi nguyền rủa hoặc khạc nhổ trên sàn nhà. The most important rule in my family is that we should visit our grandparents at least once a week. We live about 10 km away, and my parents want us to have a closer relationship with our grandparents by visiting them regularly and making sure that they are not lonely. Nguyên tắc quan trọng nhất trong gia đình tôi là chúng tôi nên đến thăm ông bà ít nhất mỗi tuần một lần. Chúng tôi sống cách 10 km, và bố mẹ tôi muốn chúng tôi có mối quan hệ gần gũi với ông bà của chúng tôi bằng cách thường xuyên ghé thăm họ và đảm bảo rằng họ không cô đơn. I'm very happy to know that you'll be staying with my family for two months. We live in a four-bedroom flat on the 15th floor. You will have your own bedroom for your stay here. You asked me about our family rules. There are three important ones that we must follow. One important rule in my family is that every member of the family has to keep his or her own room tidy. My brother and I have to make our beds every morning, and clean the floor and windows twice a week. Another important rule is that my brother and I must be home before 10 p.m. My parents are very strict and believe that setting a curfew will help us become responsible, and stay sale and healthy. The third important rule is that we mustn't invite friends to stay overnight. This is not only our family rule, but also the rule for ail people living in the building. If you have any questions, please let me know. We will try our best to make you feel comfortable during your stay with us. 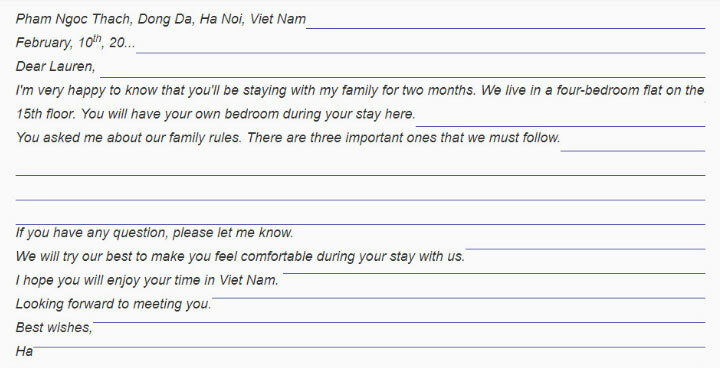 I hope you will enjoy your time in Viet Nam.